Professor/Doctor Jiri Dvorak, the FIFA Chief Medical Officer, arrived in Honiara this afternoon ahead of several important meetings scheduled for next week. Part of Prof. Dr. Dvorak’s agenda in town will be a meeting with several government ministers which has been scheduled for Tuesday. According to Prof. Dr. Dvorak, he hopes to establish a strong rapport in favour of the FIFA 11 for Health program with the leaders of the country to ensure its success in the future. I have no doubts we can develop a strong partnership with SIFF, the government, i.e. Ministry of health, Education and Sport and FIFA and use the popularity of football/soccer to contribute to the improvement of public health in particular young children,” says Prof. Dr. Dvorak. Prof. Dr. Dvorak hopes to establish a strong framework in Solomon Islands for the FIFA 11 for Health program before the implementation of a pilot project which is expected to get underway later this year. SIFF has identified eighteen (18) schools for the pilot project which will take place over 11 weeks. The Solomon Islands Football Federation (SIFF) general secretary Eddie Ngava welcomed Prof. Dr. Dvorak at the airport and said that his arrival is a significant step for the FIFA ‘11 for Health’ in Solomon Islands. “The FIFA ‘11 for Health’ program is an important one and SIFF values it greatly because it has real potential for Solomon Islands. We are excited about Prof. Dr. Dvorak’s arrival today and we hope that his trip here will be a successful one for FIFA, SIFF and football’s commitment to social responsibility,” Ngava says. Prof. Dr. Dvorak will be joined on Monday by the head of the Oceania Football Confederation (OFC) social responsibility program, Franck Castillo. Castillo’s office is strongly attached with the ‘FIFA 11 for Health’ program in Oceania and he will be joining the round-table discussions with the government ministers. 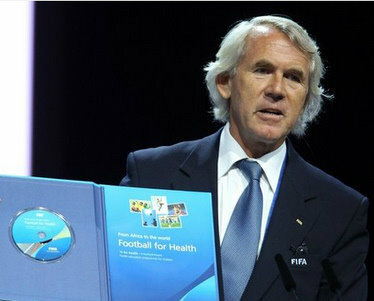 Solomon Islands is the first Oceania country to be considered for the FIFA ‘11 for Health ‘program after recommendation from the OFC president David Chung and his general secretary, Tai Nicholas. The FIFA 11 for Health is a program that utilises the power of football as a community education and development tool for promoting health and lifestyle messages. The key goal behind the program is to encourage individuals and communities to be conscious of the health issues around them and how they can address them. The ’11 for Health’ has been successfully implemented in Africa where the program has received widespread support in partner communities. In Namibia more than 2 million children and youth are involved in the ’11 for Health’. In Mauritius, the countrywide implementation of the ‘11 for Health’ for all children in their first year of secondary school (approx. 17,000) started in February 2011, in cooperation with the Mauritius Football Association, the Mauritian Ministries of Health and Quality of Life, Education and Human Resources, and Youth and Sport. The success of ’11 for Health’ in Africa has been significant and a particular study conducted in South Africa and published in the British Journal of Sports Medicine reported an improvement in the knowledge children had about health issues after completing the 11-week football education program.